The Peregrine Falcon Recovery Project works to re-establish a self-sustaining wild peregrine falcon population in Manitoba. Mystery solved. Turns out the two peregrine falcons who have been spending the winter months in downtown San Antonio are well known in their hometowns in Canada and Minnesota. They even have names: Radisson and Triumph. The two falcons, who have been thrilling tourists and downtown dwellers as they soar between tall buildings, were identified by the bands on their legs. Named after the Radisson Hotel in downtown Winnipeg, Manitoba, where she was hatched on the roof, the female falcon lives at a Canadian university in Edmonton, Alberta, during most of the year. Triumph, the male falcon, was born at the Mayo Clinic in Rochester, Minnesota; his permanent home is in Minneapolis. She’s a stately 12 years old; he’s a comparative youngster at 4. 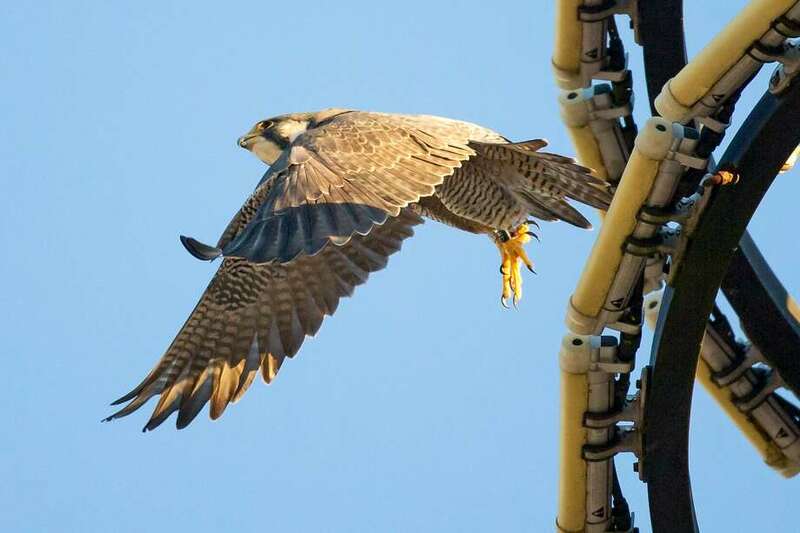 Since early January, the two migrating peregrine falcons have been living primarily on the circular spiral tower on top of the 24-story Drury Plaza Hotel. They have been seen near the Tower Life Building and other structures. Wednesday, the raptors were seen perched atop the Frost Bank sunburst logo. Soon the raptors, who aren’t related, will be heading back to their permanent homes for the spring breeding season. Peregrine falcons mate for life and the San Antonio visitors’ mates will meet them back home. The identities of the birds of prey were discovered after local bird enthusiasts sent out inquiries to fellow birders, to the U.S. Fish and Wildlife Service and falcon release programs. In a matter of days, the Manitoba Peregrine Falcon Recovery Project had claimed them. While the two birds aren’t related, their family histories do intersect, said Tracy Maconachie of the falcon recovery project. Fifteen years ago, Radisson’s mother was hatched at the Excel Riverside Power Plant, several miles from the Multifoods Tower in downtown Minneapolis, where Triumph has nested for the past two years. It’s the same site where the Canadian falcon’s great-grandmother hatched 30 years ago. “Now, these two have San Antonio in common,” Maconachie said. The interest in the raptors began days into the new year, when avid bird watcher Lance Aldridge, working in Judge Melisa Skinner’s 290th court, called attorney and raptor enthusiast John Economidy after glimpsing the falcons zipping past his window pursuing their prey. Recently, Aldridge looked out of his courthouse window and saw the falcons narrowly miss catching a pigeon atop the City Municipal Plaza Building. Later that day, he looked up at the Drury tower to see feathers from the birds’ lunch drifting through the air. Peregrine falcons are reported to be the fastest animal on the planet, with hunting speeds exceeding 200 mph. Average life span is 12-15 years, experts say. According to the U.S. Fish & Wildlife Service, there are between 2,000 and 3,000 breeding pairs of American peregrine falcons in the United States, Canada and Mexico. DDT use as a pesticide from the 1940s through the 1060s nearly caused the extinction of the species in North America. In 1970, the peregrine falcon was on the threatened and endangered species list. 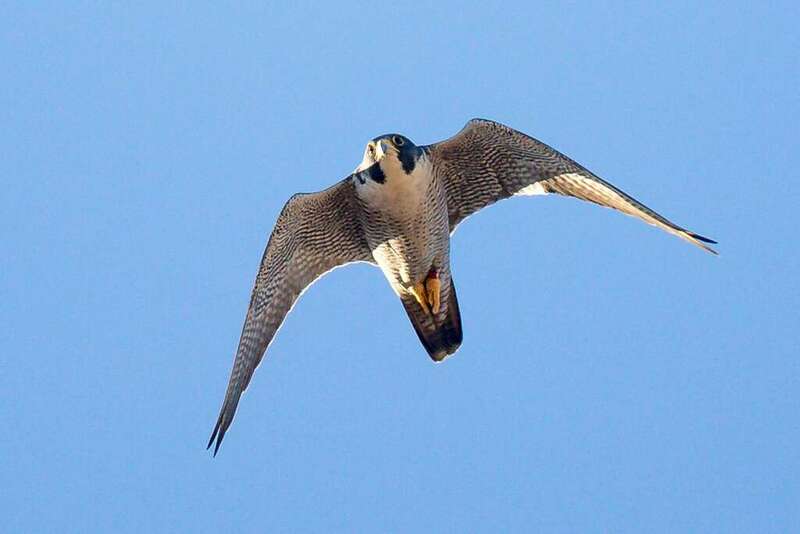 In 1981, the Manitoba Peregrine Falcon Recovery Project began reintroducing peregrine falcons in Canada with the release of four captive-bred chicks. By 1999, with help by The Peregrine Fund, falcon recovery projects and wildlife services across the United States and Canada, the falcon was lifted from the federal endangered species list. The Manitoba Peregrine Falcon Recovery Project works to re-establish a self-sustaining wild peregrine falcon population in Manitoba. We began in 1981 with the release of 4 captive-bred chicks from a site in West Winnipeg. To-date, we have helped close to 350 peregrine chicks hatch in the wild or be released safely in Manitoba. Copyright © 2017 Peregrinations | The Peregrine Chick Blog All Rights Reserved.